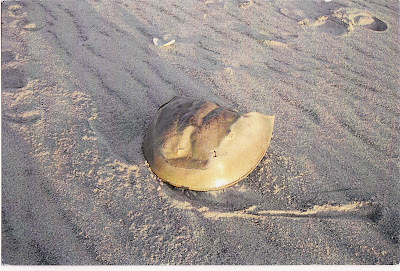 Got this postcard yesterday from author James Meek of a horseshoe crab on Assateague Beach. Which was his fun way of replying to my letter asking him for an interview! He said yes and kindly is arranging for his latest book, We Are Now Beginning Our Descent, to be sent to The View from Here from his publishers Canongate. His last book, The People's Act of Love won the 2006 Scottish Arts Council Book of the Year Award, the 2006 Ondaatje Prize and was longlisted for the Man Booker Prize. James has worked as a journalist since 1985 and his reporting from Iraq and about Guantánamo Bay won a number of British and international awards. In 2001 he reported for the Guardian Newspaper on the war against the Taliban in Afghanistan and the liberation of Kabul. "This is a brilliantly constructed contemporary novel, written with considerable style and illuminated with wit and intelligence on almost every page." "James Meek has shown ... that he can out-report more or less anyone from the trenches ... and now he has gathered together the guilty secrets of the grit'n'satphone set for an intensely flavoured excavation of our times, and made it look easy. ... The detail is wholly original. The fluency and inventiveness of the prose ranges from merely satisfying to astonishing." I'm looking forward to reading the book and will bring you the interview soon. Should be an interesting one with James' background and experiences.